4 Mount a 3/i6" round-over bit in your table-mounted router. Position the fence so the leg rides against the fence and not the piloted bearing. Rout round-overs on all but the top ends of each leg. Without the fence, the router bit would gouge into the areas around the notches and mortises where the bearing would not have a surface on which to ride. ICut the end apron rails (B), the front-apron rail pieces (C, D, E), and the back apron rail (F) to the sizes listed in the Materials List. 2 Keeping the ends flush, glue and clamp the front-apron rail pieces (C, D, E) together in the configuration shown on Drawing 2. 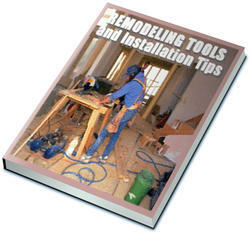 3 Using your tablesaw fitted with a miter-gauge extension and a dado blade, cut tenons on the ends of the front, back, and end apron rails. See Drawing 2a for reference. (We cut scrap stock first to verify a tight fit of the tenons in the mating leg mortises.) 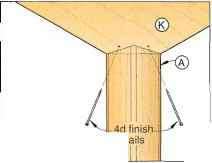 Use a stop on your miter-gauge extension for consistent tenon lengths. 4 Mark the locations, and cut three 3A" dadoes [A" deep on the inside surface of the front and back apron rails (C, F), where dimensioned on the front rail on Drawing 2. 5 Mark the centerpoints, and drill -Vs" holes 3/i6" deep centered over the dadoes cut in the previous step, where located on Drawing 2. Next, drill a 5/32" hole centered inside each 3/8" counterbore. 6 Cut the '/»" grooves on the inside surface in the end aprons (B) for housing the tabletop fasteners later. Cut a scrap piece of wood first. We found that tabletop fasteners vary slightly in size and require different groove locations. See Drawing 3a for reference for our particular clip. 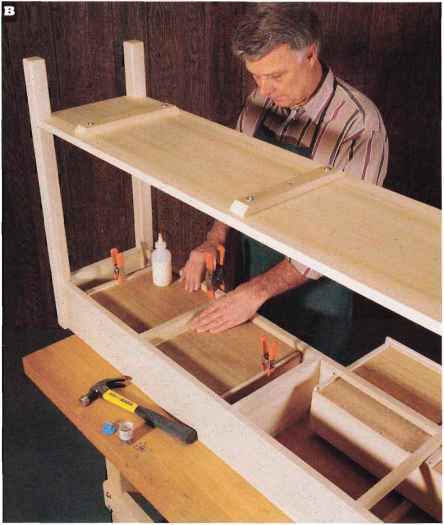 Slide the drawer bottom guides against the drawer supports, and then glue and nail the guides to the drawer bottoms. Glue and clamp the front and back rails and shelf between the end leg/apron assemblies. 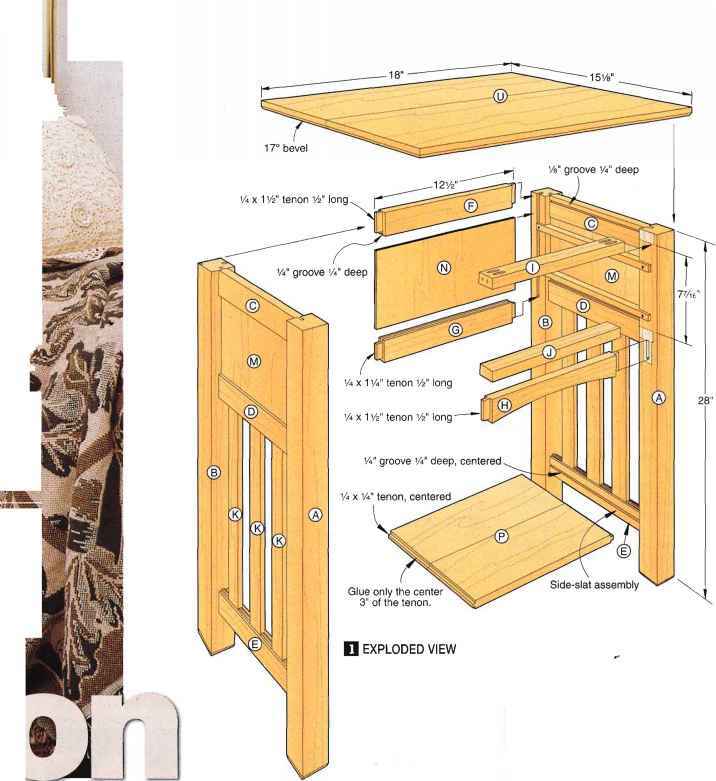 U Drill pilot holes, and toenail two 4d finish nails through each shelf corner and into the legs, as shown on Drawing 3c. This secures the shelf to the legs at each notch. 1 Measure the distance between the front and back apron rails. Cut the center divider (G), cleat (H), and drawer support guides (I, J) to the measured length from the thickness and widths listed in the Materials List. Rout the groove in H, where shown on Drawing 3a. Glue and screw the pieces in place. 2 Cut %" plugs, and plug the counter-bores over the heads of the screws. Let the glue dry overnight before trimming and sanding the plugs. 3Cut narrow pieces of 3/4"-thick oak to form the top (M). (We cut four 5"-wide pieces to 73" long. Then, we jointed both edges for a final width of 47/8" for each piece.) Match the grain, and edge-join the pieces, with the ends and surfaces flush. Later, trim the ends of the edge-joined top to 71 '/>" long. Then sand the top smooth. 7 Glue and clamp an end apron rail (B) between two legs (A). Check for square. Repeat for the other pair of legs and end apron rail. Set the two end leg/apron assemblies aside for now. 8Edge-join enough stock to form the bottom shelf (K). Later, remove the clamps, trim ends square, and miter-cut corners, as dimensioned on Drawing 3. 9 Cut and add three cleats (L) to the bottom surface of the shelf. Note that the cleats have slots allowing the outside screws to move with expansion and contraction of the wide shelf. Drill the mounting holes and form the slots in the cleats now. ICut the drawer fronts (N), sides (O), backs (P), and plywood bottoms (Q) to the sizes listed in the Materials List. 3Rout the ends of the drawer backs (P), where shown on Step 2 of Drawing 4a.